Gainesville, Florida June, 13th 2013 – Aaron Bosshardt and the Vice Presidents of Bosshardt Realty Services met this morning and unanimously voted to appoint Chris Handy to Vice President. The Vice Presidents wanted to acknowledge Chris Handy’s work in the profession as a Realtor, and his volunteer work at the Board of Realtors, as well as the tremendous character he’s shown both as a professional and a person. Chris epitomizes the true nature of what a Vice President at Bosshardt Realty should aspire to. 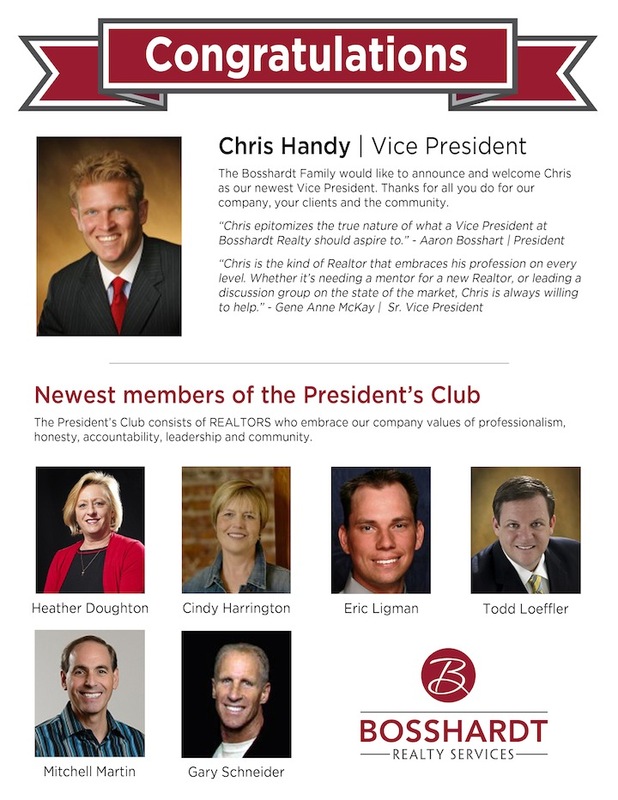 Please join me in acknowledging this great accomplishment of one of our new Vice Presidents, Chris Handy. Please join me in congratulating Chris. Additionally the Vice President’s recognized the outstanding service and work that the following Realtors have accomplished: Heather Doughton, Cindy Harrington, Eric Ligman, Mitchell Martin, Todd Loeffler, Gary Schneider by asking them to join the President’s Circle.